The iOS infrastructure readily allows iPhone, iPad and iPod touch users to send and share images through various mediums, including email, social networks and Messages. However, the process is certainly not without its fair share of limitations. For example, if you’re in the Messages app and want to send an image you have just taken, you must proceed through the rather tedious rigmarole of opening your camera album, selecting that last taken shot, and then tapping on it. 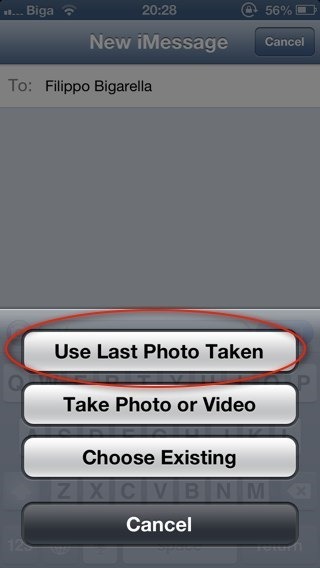 The aptly-named LastPic tweak operates on the supposition that, more often than not, you’ll want to be sending the most recent pic taken with your device’s snapper, and allows you to do so without that additional navigation. It brings a simple, "Use Last Photo Taken" button when you hit the camera button within the Messages app, which cuts out the middle man and makes your iOS experience just that little bit better. Although there are certainly bigger and badder offerings gracing the Cydia Store, this kind of tweak is, to me, the pinnacle of what jailbreaking is all about. It’s not going to dramatically change the way you use your device; you may not even send images that often. But when you do decide to send a snap through to a friend, relative, work colleague, or associate, LastPic will give you a leg up if your intention is to send something you have just snapped. Of course, if you’re taking a snap with the intention of sending it to somebody straight away, then you can use the integrated share feature within the Camera app. Nevertheless, this is still useful, and costs absolutely nothing to download over at the BigBoss repository. In order to take advantage of this tweak, you’ll need to be jailbroken of course. LastPic works with iPhone, iPad and iPod touch, and although you’ll probably take snaps using your iPhone the most, I suspect many of you will be looking cover all bases. Please note, there are no configurable settings for LastPic; if you no longer wish to see the button, simply uninstall via Cydia.